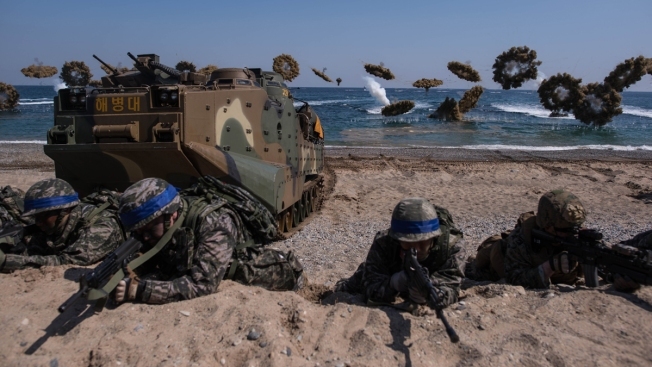 This March 12, 2016, file photo shows South Korean and U.S. soldiers take position during an annual joint military landing exercise in Pohang, on South Korea's southeast coast. South Korea and the U.S. are eliminating their massive springtime military drills and replacing them with smaller exercises in what they call an effort to support diplomacy aimed at resolving the North Korean nuclear crisis. The decision announced by both countries Sunday came after President Donald Trump complained about the cost of joint drills even as his high-stakes second summit with North Korean leader Kim Jong Un collapsed last week. The drills' cancellation is an olive branch to North Korea, which has viewed them as an invasion rehearsal. But some experts say it will likely weaken the allies' military readiness amid worries that tensions erupt again in the wake of the failed nuclear summit in Vietnam. The Pentagon said in a release that the U.S. and South Korean defense chiefs decided to conclude the Key Resolve and Foal Eagle series of exercises. It said the allies agreed to maintain firm military readiness through newly designed command post exercises and revised field training programs. Talks between the leaders of the United States and North Korea broke down on day two of their second summit. President Donald Trump and Kim Jong Un were not able to reach a consensus on denuclearization and sanctions, Trump said. Acting U.S. Secretary of Defense Patrick Shanahan and South Korean Defense Minister Jeong Kyeong-doo "made clear that the alliance decision to adapt our training program reflected our desire to reduce tension and support our diplomatic efforts to achieve complete denuclearization of the Korean Peninsula in a final, fully verified manner," the statement said. Seoul's Defense Ministry released a similar statement. Jeong expressed his regrets at the lack of agreement at the Trump-Kim summit but still hopes that Washington and Pyongyang will continue negotiations, the South Korean statement said. The new training, dubbed "Dong Maeng," which means "alliance" in English, starts Monday and runs through March 12. It will focus on "strategic operational and tactical aspects of general military operations on the Korean Peninsula," South Korea's military and the U.S.-South Korean combined forces command said in a joint statement. According to U.S. officials, the new training will be done in smaller drills, tabletop exercises and simulations, and will involve smaller units such as battalions and companies rather than massive formations involving thousands of troops, as they had in the past. Officials said the Pentagon would focus on smaller exercises and mission essential tasks, which include the ability to integrate airstrikes and the use of other weapons systems, drones, surveillance assets, logistics and communications. In November, a month before he resigned as defense secretary, Jim Mattis disclosed that the U.S. and South Korea would scale back and tone down the spring exercises. He said the aim was to avoid setting back diplomacy over North Korea's nuclear weapons. He described it as a reorganization of the exercises, not an end to maneuvers on the peninsula. Trump has long complained about the cost of military drills with South Korea. 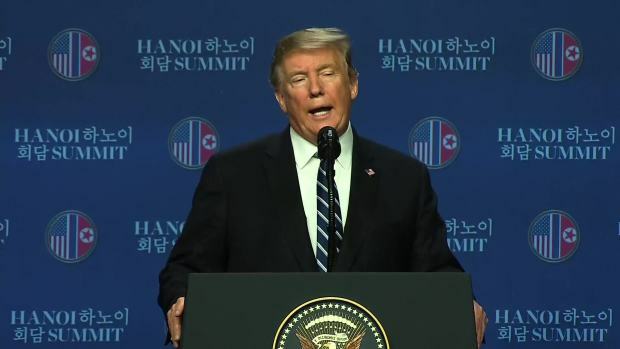 After his second summit with Kim ended without any agreement in Hanoi on Thursday, Trump spoke again about the cost of annual military drills. "It's a very, very expensive thing and we do have to think about that, too," Trump told reporters. Following his first summit with Kim in Singapore last June, Trump caught many in the United States and South Korea by surprise by suspending the allies' summertime military drills. He called joint drills "very provocative" and "massively expensive." The United States and South Korea also have since suspended a few other smaller joint drills. Trump has also pushed South Korea to increase its financial contribution for the cost of the 28,500 U.S. troops stationed in the country as deterrence against North Korea. He previously threatened to withdraw troops from South Korea and Japan if those countries refused to pay more. 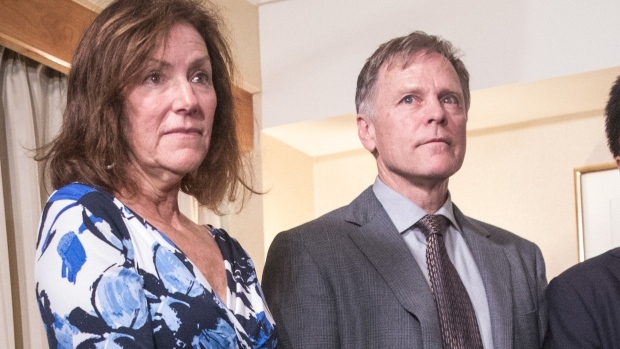 Fred and Cindy Warmbier responded to President Donald Trump’s claim that North Korean Leader Kim Jung Un was unaware of the mistreatment of their son during the 17 months he was detained in the North Korea. The end of the springtime war games will benefit North Korea, which has responded with its own costly military exercises and weapons tests, including firing a new intermediate-range missile over Japan in 2017. North Korea's state media on Sunday didn't immediately comment on the drills' cancellation. After the Hanoi summit, the United States and North Korea blamed each other for the breakdown of the talks. But both sides stopped short of pulling out of negotiations.